Eighteen months ago, the OptimizePress team started out on a huge development project investing tens of thousands of hours into building a brand new version of our tool that would create new possibilities for businesses and incredible experiences for their prospects and customers. A new version of the WordPress plugin you already love, making it easier for you to market your business online and generate more conversations, conversions, and consistency in your business’ success! Today, we’re giving you the first glimpse of the new OptimizePress 3.0 Page Builder, which is just one part of the all-new OptimizePress. I’m sure you’re curious to find out more about what’s coming and we’re super excited to be sharing this first look behind the curtain of what OptimizePress 3.0 has in store for you (and your business). When we set out to develop the new OptimizePress Page Builder, we identified the key factors that influence the conversion rates of your websites, and one of those is page load speed. A common problem is that most website editors are built with lots of complex code or littered with unnecessary files. This slows down the loading times of your live web pages, which in turn can drag down your SEO rankings and higher bounce rates — you’ve put in the hard work to grow your presence, but it’s the factors that aren’t always visible that can keep you from seeing better results. We wanted to give you super-fast, industry-leading page load speeds, so we started from the ground up to ensure every page created with our 3.0 editor uses clean, minimal code with no additional bloat. The truly great thing when you use our new editor is that you don’t have to do any extra work to get super-fast page speeds, we have taken care of that for you! 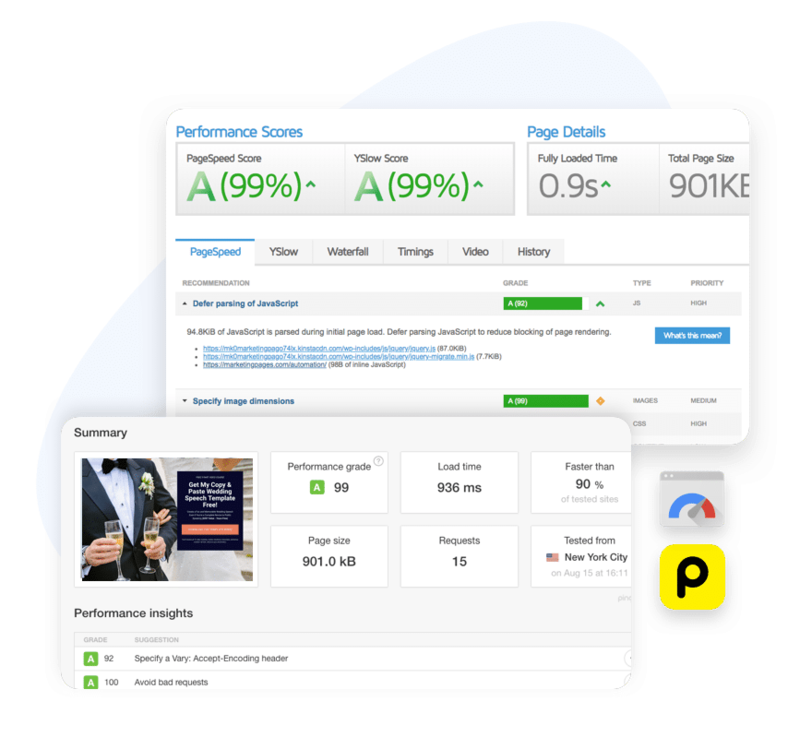 Throughout the course of developing our new page building platform, we regularly tested with key performance review tools like Google Pagespeed and GTMetrix - you can see some of the results an average landing page received above. WYSIWYG — usually, not so much. Traditionally website editors have lots of pop-up menus or endless sidebar options. This is a problem because you waste time clicking through settings and this leads to frustration and increases the possibility you won't get your campaigns launched successfully. While building the new OptimizePress 3.0 Page Builder editor, we focussed considerable time on making sure the new editing experience was easy and intuitive. We worked through every single setting, carefully refining the way you build websites so that we could eliminate complexity. Our 3.0 Builder gives you capability without complexity. As soon as you use the new editor, you'll know what we do - there's never been a better way! We've made huge breakthroughs with the new editor and moved the editing options directly into the page as you edit. Having the options directly in front of you as you build your websites, speeds up your progress and makes editing a page so simple. It also means you get a seamless full-screen editing experience. Whether you're building a page from scratch or using our brand new WordPress landing page templates or Sections (more on that in just a bit! ), you'll find creating amazing high converting websites is effortless. Edit inline with our contextual toolbar - Customize your page lightning fast with our toolbar that only shows the options you need for the element you're editing. No need for sidebar options - we have removed the need for sidebar options in most situations meaning you can enjoy a beautiful full screen editing experience (especially on laptops and smaller screens). Elements are the building blocks of your landing pages, sales pages and websites. Our new platform includes a rapidly expanding library of elements to fit any kind of page you'd like to build. 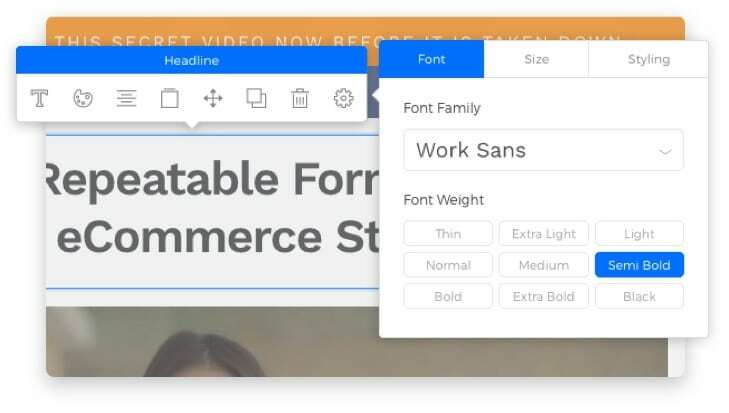 As well as including a wide variety of elements, most elements inside the OptimizePress 3.0 Page Builder include carefully crafted style alternatives so you can find the perfect design for your page or funnel. We know a “one size fits all” approach to your marketing strategy doesn’t work, and the same is true for your marketing pages, so our element styles will let you choose the design that fits with your page vision, whilst still ensuring every part of your page is conversion-optimized for maximum results. We know one of the most important things you're looking for in an editor is layout flexibility. With our 3.0 editor, we now bring a new level of layout flexibility with sections, rows and columns to make it super-fast and easy for you to achieve the design you're looking for. Visually adjustable column widths - just drag to adjust. Set section and row minimum heights, or set to scale to screen height. Adjust padding and margins of any section, row, column or element visually with easy to use sliders (and set negative margins where required). Adjust column gutters (space between columns). Nest rows within rows for almost unlimited layout possibilities. Visually add underline, bold and italics, as well changing text colours inline with no need for custom CSS or coding. Excited much? Join our early access list and get an exclusive insider first look at the new platform. Join our exclusive OptimizePress 3.0 early access list to be notified when we release any news on the new platform. We'll share news, features and exclusive invites to get access first ONLY via this list! You use OptimizePress throughout your online business, so creating a brand new editor was a great opportunity for us to rethink and improve the way you create websites. Conventional website templates often lack the optimized elements you need and this means poor conversion rates. Today, we are thrilled to announce the new way you'll build your websites - Sections. Sections are pre-optimized combinations of elements that you simply drag and drop onto a page to make amazing looking websites. We have all the sections you need pre-created and optimized for conversion in a dedicated cloud-based sections library. So much of the conversion optimization on a web page is the stuff you don't obviously notice, like spacing between elements, fonts sizes, and colour combinations. Using Sections means all of the individual optimizations are done for you. This feature alone gives you the power to deploy more beautiful, higher converting pages faster than ever before, and makes you look like a professional designer in the process! When we introduced mobile responsive websites in OptimizePress 2.0, we truly believed in the future of mobile web pages. But mobile isn't just about how your website looks on a phone or tablet, it's about how content works and whether it's optimized for conversion on a mobile device. In the new OptimizePress Editor, we've introduced 'Optimize For Mobile' and made it effortlessly simple for you to customize your website specifically for the various mobile formats of tablet and phone. Now you can customize your website specifically for the device your visitors are viewing on. You’re customizing for experience and engagement — what your visitor wants most. When your new website is created, you can simply switch to view how it looks on a tablet or mobile device. You can change, hide or add any content for each specific device type. This means regardless of how a visitor views your web pages, they will display in the most optimized format for that device. This ensures that you convert visitors in whichever format they view your content and offers. A key advantage of WordPress is flexibility, but it is very easy for your setup to get complicated with a minefield of plugins. To help you progress effortlessly, we have built the new OptimizePress Page Builder to work with any theme. Even with the new WordPress Gutenburg editor, this does not give you marketing and conversion focused elements that are designed to increase leads and sales from your website. With the OptimizePress Page Builder 3.0, you can edit any page or post content within your theme framework. This means you can customize layouts (add rows and columns) and add any of our marketing specific elements like opt-in forms, popup overlays, countdown timers and much more, all with no additional plugins. This power previously required you to be a PHP expert or HTML ninja. Was that a collective sigh of relief we just heard? Want To See More New Features? The New OptimizePress Page Builder is just one part of some amazing new updates coming to OptimizePress. In the coming days, we'll be taking you behind the curtain and revealing more of the amazing new features we have been working on. 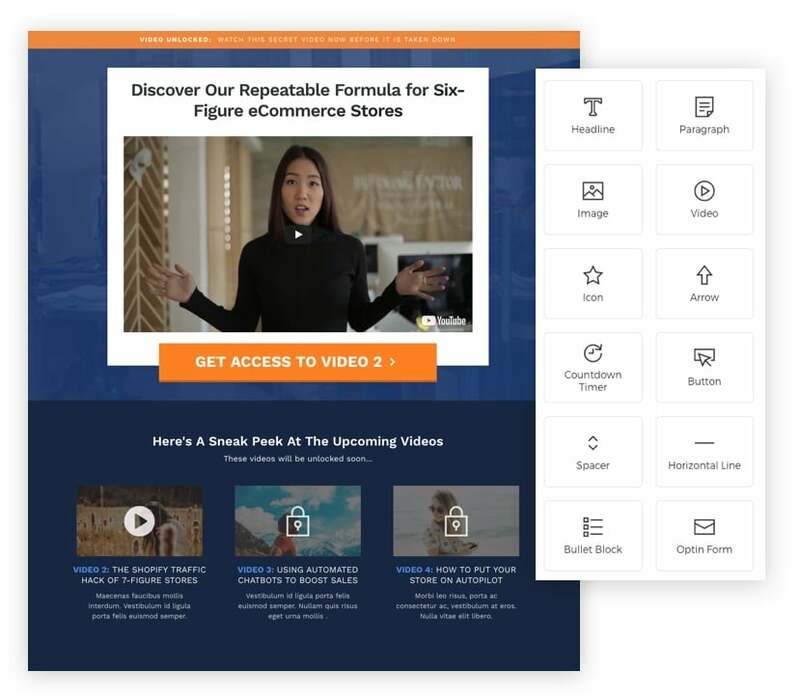 Plus, we'll give you a first look at a brand new industry-leading tool that is going to make it super easy for you to create funnels that market your business and sell your products and services. We can't wait to share the next updates with you. Which of these new features are you most excited about? What features do you think we should add to OptimizePress? Join our exclusive OptimizePress 3.0 early access list to be notified when we release news on the new platform. We'll share news, features and exclusive invites to get access first ONLY via this list! 141 replies to "The New OptimizePress is Here! Get a Sneak Peek of 5 Features in The All New WordPress Page Builder"
Nice guys/gals! If I renew my subscription for OP 2.0, will I be upgraded upon release? Or will this be a brand new product? What Is pricing going to look like? Thanks for your question Nick. The OptimizePress 3.0 Builder is part of a brand new suite of tools we are releasing. In terms of pricing and releases, our Club members will be first to receive the new OP3 and this will be included within their subscription. After this, our customers with an active support & updates license for OP2 will get access as part of our commitment to existing customers. If you have previously held an OP2 license and renew that before the release of OP3, you will also receive access when it’s released to our main customer base. As far as pricing going forward, we haven’t finalised this yet as some of the elements of the OP3 suite will be tier specific. We’ll release more information about this in the coming weeks. Hi Kirk. Right now we’re doing internal beta testing and finalising of the platform before it’s released. Because we know some issues can come up in beta, we have not set a final release date, but we are aiming for a January public release. Our Club members will get access before this, most likely in December, and then gradually released out to current customers with active support and updates, and then finally open to new customers. I hope this helps – I appreciate not releasing an exact date can be frustrating but we don’t want to push the platform out before it’s fully tested and ready. So I have a Your OptimizePress License Expiration on: January 9, 2019. Do Pro Members have access? So on Nov 21 you did not have a date. Do you now. I have a 1 year anniversary of my OP2 licence on Jan 8th. I don’t want to upgrade only then to have OP3 come out a week later. What should I do? What’s your date? January!? WOW. It is a New Year after the New Year! Thank you OP team. Any plans for developing a 1-click upgrade feature within the software so the cc info gets applied to the whole order when a customer wants to super-size their order? That would help make larger sales (instead of the customer having to reenter their cc info). Have always used and supported OP right from day dot. Will continue to support you if you plan to look after us stalwarts! Wow. The new features look great! As far as my favorite, since I use both Optimizepress and Divi, I was recently thinking I wish either had something like the new sections functionality you all have now created. Sweet!!!! Looks like I’ll be using Optimizepress a lot more when 3.0 comes out! Awesome! Thanks John. We hope the sections functionality will mean that any user of the platform can create custom designs to fit their niche or market without needing to be a designer. This means much faster page creation and therefore faster route to getting your marketing campaigns started! Are we able to upload our own fonts? I would love to see more dark background (i.e., any color but white) themes. Yeah, white is popular, but there are other design vibes out there. In your current themes for V2, I can rarely find anything I want to use without doing major reconstruction. Hi Michael. OptimizePress 3.0 will include a number of tools, the builder as you see in this post will be a plugin. It will work with the SmartTheme so you can edit post content in the SmartTheme and make your posts look beautiful (like this post). We still have plans to develop other themes in the future too and the SmartTheme will be fully compatible. Even though I’m on the support team here I have been testing a pre-beta for some time and I’m very excited about the new OptimizePress and what it will help everyone achieve. Looking forward to the beta testing and release so everyone can get their hands on the new editor. I would spill the beans here about all the awesome features but I don’t want to spoil the fun. KM, we can’t wait to get to you and see the amazing things you will do with it! Is it RTL (Right-to-left) compatible? We plan to publish a “roadmap” for future development as James mentioned. This roadmap will give an overview of the new features, integrations and plugins the OptimizePress team are working on. Thanks. Even if you do not release a full RTL compatibility I would rather have a basic freedom to control it from within the editor and to tweak it myself (even as a temporary patch solution) to be able to use your excellent product till the time you fully release your support statement. So basic is RTL paragraphs, launch funnel menu and opt-in forms. Looks great but as Nick H said, it’s all down to pricing, and what features you get for what price… is it all included in the one price? Exciting times ahead for OP users! Great job James and the OP team! OP3.0 looks like it’s going to lead the field AGAIN and be the one that everybody else looks to emulate. James, I found OP originally through Brendon Burchard teaching. He now seems to have completely thrown his lot in with Kajabi despite building all of his original winning pages using OP. I’m primarily interested in my monthly training membership site, building courses and adding new paid members – Will OP3.0 offer and provide a serious alternative to Kajabi for peeps like me? Roy – great to see you here. We’ll definitely have developments in the membership and online course functionality once we have the main page building platform launched. Hi Glenn. With regard to Drip releasing content – do you mean more for membership functionality rather than sales funnels? We’ll certainly be offering drip release content on membership pages through OptimizeMember and an updated version of this in the future. Hey OP Team! This new version looks awesome and I look forward to using all the upgrades. Now, I think that I will love the page builder that is now going to be new to OP3. I will admit that I have tried to use things Kajabi, Kartra, and looked into all the other funnel building options out there. I didn’t stick with any of them because of the ease of OP. However, the reason I looked into other funnel builders is because of the shopping cart ease to set up like in Kartra and then the ability to have a easy list building function with “if this, then that” options to avoid the hassle of using other add on like aweber. I currently us aweber and love it, but I’m always looking into making my whole process seamless for myself and my customers. Mostly because of stats for me. Now, my question would be around is there going to be a shopping cart function or something easy to create check out pages for adding sales to our businesses without having to go through a membership format? Lastly, would there be a function to move toward a contact list within OP verses using aweber or others? Last, last…what about hosting videos and creating something where you can do more layout functionality within the videos rather than having to use YT, Vimeo, or others? Hi Jason Thanks for the feedback. We do have some developments in the shopping cart area coming after launch. In terms of autoresponders and mailing list software – we believe in letting companies like AWeber, ActiveCampaign and Drip do what they do best. Running an email marketing service is complex and it’s not something we plan to focus on – we would rather provide easy to use integrations with the market leading software solutions out there. So we always advise using one of those to ensure you get the best deliverability and functionality for your email lists. Please ensure video links from Amazon S3 can work on your platform as well. That would be great. I don’t wish to pay another monthly fee for video hosting Amazon S3 is so cost effective. For all the data I STORE there I’m paying less than $5 per month. What is the rough time frame for OP3 release to club members? Hi Ofer, thank you for your question. OP3 is currently in final stages of beta testing, and we will be able to update you in a week or two with a more defined release date for OP Club members. Our entire team are working at full steam to get it out to you asap. Good. 2 weeks went by. Is there any data for schedule? I am seeing a lot of OptimizePress 3.0 pages in 2019. Yahoooooo!!!! Thanks for your comment Rolf! Great News. I will take this upgrade for my account. James can you talk more about speed? I ran this page through Pingdom and, well you will know. How good is the speed really going to be, and how can you overcome what I understand are fundamental load speed issues associated with WordPress? Thanks for your question Justin. I appreciate you testing this page – although it’s edited in OP3, it’s a SmartTheme blog post on a site which is running OP2 and many other tools also – so not the streamlined environment we’d recommend for new landing pages. We’ve taken a number of steps to optimize speed including optimizing loading of css on landing pages (so no CSS bloat is added). We’re also optimizing font and icon loading, and only loading files absolutely necessary for the design and layout of the page. We’re also implementing more of our own optimization across the platform to make WordPress pages as fast as possible and reduce bloat – we’ll share more about this in the run-up to the final release of the platform. I am THRILLED to see OptimizePress growing into version 3. We run a membership site based on OP2 and OptimizeMember. Of course we have hundreds of pages that are build with the visual editor. • Will OP3 be fully backwards compatible OP2 page elements? • What’s the upgrade path? • Will OptimizeMember still be fully supported in OP3? • Is it going to be possible to finally have direct access to the full html of a page in OP3. I use the visual builder Thrive Architect and while it’s filly a visual builder, I can click their pages gear icon and directly access that pages FULL html. This is enormously helpful becaus our posting workflow starts in a FileMaker database where we enter all the content and then generate the html block in FileMaker which is 100% comparable with Thrive Architect. We paste the html from FileMaker in to the page’s master html area and BOOM the post to DONE in seconds vs hours of manually doing all the element placing, formatting and content. I REALLY hope you will allow us direct access to the FULL html of the page so I can have FileMaker generate compatible code to use in an instant. 1. I will have to purchase an entirely new program? 2. will my old pages still be live when oP2 comes out? 3. Will by old pages be automatically transferred and installed and viewable in OP3 or will I have to rebuild everything?? 1. The OptimizePress 3.0 Builder will be included for anyone that has an active support & updates license for OP2 at the time of release. We’ve always said that our support & updates license covers you for new releases and updates to the platform, and although this is a major update, we’re still treating it as an update and therefore you will get access if you maintain an active license. 3. There is not a direct backwards compatibility – so OP2 pages will not be editable with the OP3 editor. I mentioned some of the reasons for this in one of my other replies here but essentially the platforms are built on completely different frameworks and in order for OP3 to be the best it can be, a full backwards compatibility was not possible. This doesn’t mean you have to rebuild everything though as you can still use OP2 as you wish. I hope that helps offer some reassurance. We want to make the transition process to OP3 as smooth as possible and we’ll be doing everything we can to help with this. We’re also confident that when you see the ease of use of the new editor, you will not have any problems with building exactly what you want – even without any graphics or pagebuilding experience. This looks fantastic!!! How will our current pages on 2.0 work with 3.0? Will we have to re-do them entirely? Brenna – thanks for your question. OP3 is built on a new faster, more flexible framework compared to OP2. The components that make up the pages are all new, and optimized for 2018 and beyond. This means that bringing in backwards compatibility would risk slowing down new pages as we’d have to incorporate old elements and the bloat that comes with some of those. Our focus for the new platform was speed, simplicity and flexibility. We have achieved these but at the initial cost of backwards compatibility. We feel that the results you will get with the new pages will far exceed any trouble caused in recreating pages. It’s also important to note that building pages is MUCH faster in the OptimizePress 3.0 Builder, so you’ll have no problems replicating your pages. Our longer-term vision is to build a transition tool to allow you to import OP2 pages into OP3. This won’t work in all scenarios (where you’ve used a lot of custom CSS) but it will enable some of your pages to be brought over. This is something that is a little way off at the moment as we’d rather dedicate development time to making the new platform as powerful, easy to use and fast as possible for you. We’d rather be completely transparent about this – it was a hard decision to make but something which we believe will stand the new platform in the best position to be the leading WordPress page builder for 2019 and beyond. Remember that OP2 and OP3 page builders can run on the same site, so you don’t need to rebuild all your pages right away. We’d recommend just rebuilding your most used landing pages and either testing the new templates we will be including or rebuilding them just for the speed improvements. This is the best news of the year. I’m with Optimizepress since I started with version 1. I love it! One question: Is there an update for Optimize Member that I also use? Thanks Arturo! The new platform will work with OptimizeMember. We do have plans to update OptimizeMember but for now it will work with the new platform as it is. I’ve been a long-term user and raving fan of OP1 & then OP2. Can’t wait to get the new OP happening. Well done, James and all your team! Should I stick with OP2, which is new to me, or sink more money (ugh) into another version? Hi Keith. Thank you for being a long-time customer :) If you recently purchased OptimizePress 2.0, you’ll automatically get access to this new version when it is released. We’ll be sharing more about this in the coming weeks as we release more OP3 information. I’m a customer with an active subscriptions, so I’m excited about all these new features! I have a OP 3.0 feature question: will we be able to do things like add drop shadows/shadow effects on content boxes, columns or to other elements? Hi Chris. Awesome to hear you’re excited – we are too! Yes you can certainly add drop shadows on most things in OP3 – text, boxes, columns, sections and more. We obviously always recommend not going too crazy with shadows, and our pre-made designs and templates will help you create something beautiful without being a designer. It is very exciting. Thank you very much for the effort. Before viewing this article, I just though OP3.0 will be a SaaS, but turns out that it is not. But it is fine. One question: one key features/pressing needs I would like to have in OP3 is a survey function. Would it be there? What if you use OP2 with the template files from that version (OP2 builder). What happens if you upgrade to OP3? Must i have a completly new theme? Or can i just upgrade and all will be the same + better? Thanks guys. Is OP3 compatible with OP2, e.g can I just upgrade without having to rewrite all the pages? And pricing, if you can let us have details of that it would be great. Thanks for being a longterm customer Torkild, it’s great to have you with us on this journey! We’ll be sharing more information about backwards compatibility in a video soon – but initially at launch we won’t have a direct backwards compatibility with OP2 pages. The reason for this is that OP3 is built on a new faster, more flexible framework compared to OP2. The components that make up the pages are all new, and optimized for 2018 and beyond. This means that bringing in backwards compatibility would risk slowing down new pages as we’d have to incorporate old elements and the bloat that comes with some of those. So if we upgrade to OP3 and already have HUNDREDS of OP2 pages… what happens to them??? Do they remain on the site as is and can still be displayed in their present for? Or are you suggesting that the moment we upgrade to OP3 that ALL our OP2 pages must be rebuilt?!?!? If that latter is the case why shouldn’t we all just move to a competitive product since OP3 is essentially an incomparable theme without backward compatibility? I hope to god that you rethink this scenario and billed in backwards compatibility for OP2 pages. Otherwise OP3 is just a theme change and offers no compelling reason for business built in OP2 to upgrade vs move to a competitor. So when is OP3 due to be realized? Also is this version still heavily focused on blogs and membership sites? I just use it for landing pages and funnels for paid traffic sources. There’s so many questions I have. Thomas the new editor will be flexible enough to be used on blog pages and posts as well as building membership sites, landing pages and funnels. The Editor will form the base of many of the new functions in the OP3 suite. Finally, I can come home. A great announcement…loving the new page builder…and the ability to set the format for PC, tablet and smartphone separately (it’s always been a problem for me having a great looking pc page which on tablet and phone looks pretty bad due to image and content spacing from the sides, also background images being left justified rather than centred). Hey Steve, glad to see you here! We hope you keep using OP and building awesome pages. We’ll have an update out very soon. How will OP3 compare to other Page Builders like Thrive Architect, Elementor or Beaver Builder?? From what I saw on the tease video, the UI and the functionality look very similar, so it would be great to know the reasons why users should choose OP3. Hey Angel, we have a few other things in the pipeline to make OP different. One thing that really stood out for us was the loading speed of the other builders and ease of creating a page for a complete novice. One question…I was wondering if there will be more course/membership related functions with OP3? Hi Genevieve, thanks for your comment. We’ll be sharing more about developments in this area soon. Were there particular features you were looking for? The new editor will allow us a lot more flexibility in all areas of the editor, and the membership and online course page development is definitely an area we plan to address. The new editing functions look very good – pity I haven’t yet launched my finished course teaching people how to use Optimizepress 2.0 !!! One of my main wishes was to allow students of my courses I build in Optimizemember to be able to continue where they left off – like part way through a particular video or module without having to remember where they last viewed it. Will this be incorporated in 3.0 ? This looks great. I hope integration with Zoom will be available similar to GotoMeeting. I assume Infusionsoft will still be supported. Finally I want to use MobileMonkey chatbot but cannot loaf this into the footer area. As this is a type of product becoming normal do have any functionality for this? Will 3.0 now be compatible with the Divi Theme? I am looking forward to OP3 supporting Order Bumps! Wow! That’s great news. I was thinking about getting another page builder because i think OP 2.0 is a little bit out-dated but now i know OP 3.0 is coming up I will keep using OP for sure. I’m a clubmember so looking forward for december to try the new version. Good job people from OP!! For the new update and shopping cart developments. – Will you have the ability to connect pages with “stripe and paypal” directly, instead of having to use third party plugins? – Then be able to do something similar to clickfunnels (one click upsells and bump offers) ? These features would massively take the whole funnel experience to a new level for many, not just myself. We’ll be sharing more about those features after we have released the main Page Builder platform which is the first product in the suite we’ll be releasing. Keep an eye on your inbox and the blog for more announcements soon! Hi James and the rest of the OP team. My membership site is similar to say, Kajabi, but much more clean and user friendly, because of the customizations I had created for it over to the OP3 platform. Will you be offering free support in this transition for customers such as myself? How long will you continue to support OP2 during this transition? These are very important issues to me and I assume anyone else that has created custom membership sites with OP2. Will this new upgrade also include improvements to Memberpress? I also see you’ve answered that the old platform will play well with the upgrade on existing sites, that’s good news. I look forward to the new release. Huge fan of the platform. I was using ClickFunnels and switched back due to the ease of use. I’m also hoping the shopping cart will be more robust and attractive. Hi there… A long time OP supporter here too. With OP3 will you need to redo your pages? Hi Malene, OP£ is a completely new page builder that produces pages with cleaner code and more functionality. You wont need to change existing page if you don’t want. Exciting news, James & TeamOP! OP3’s inevitable evolution from dialog boxes and shortcode generation to real-time, inline editing and drag-and-drop Sections is clear and away the mechanism through which modern page building gets done going forward… I’m friggin’ excited to put it to work IN OPTIMIZEPRESS! As the class-act you’ve always been, and shown in the comments on this very thread, it’s clear that you’ve taken care of your existing long-term OP users. All I want to know is, When will OP3 release? Looking forward to taking OP3 for a drive. I do have a question though. . . . the “MarketPlace” sells page templates, will these be compatible with OP3? -or- if we want to use them will we have to stay with OP2? Ideally you’ll release OP3 soon and the templates I want will work. I’m also a long term OP1 & OP2 user; looking forward to OP3. Question: Have you thought of a better way to organize uploaded images under Media? It’s frustrating to have to scroll through dozens of pages of uploaded images and have to sort through (and exclude) the images uploaded by OP for your demo pages. Sometimes my keyword searches don’t pull up the right image. Hey Sue! Thanks for the feedback, there’s not really a way we can change that. Have you tried looking for media file organiser plugins? I’m sure there’s some out there. Still using OP2 for my product launches since a long time now, as it’s the only WordPress platform that would allow me to have a proper launch site Jeff Walker’s style, protect the content, for evergreen or “one-shot” launches. I had to switch to Divi for my sales page to get a more modern look (and saw a big boost in conversions, so that counts). I feel like I could probably switch my launch websites entirely to OP3 now, which would be great. OP3 is still gonna handle product launches features, right ? Hey Laurent, are you referring the launch suit or just building static pages fo your launches? How do we migrate an OP2 site to OP3? Can OP2 and OP3 operate on a single site concurrently for an incrimenftal conversion process, or do we have to perform amass upgrade from 2 to 3 for an entire site? I love OptimizePress but had to switch; I have tried different hosting services, but always end up database slowdowns or intermittent locks, it’s only when looking at server logs I see this, while this is a budget hosting trend and not an Optimizpress issue. The best solution would be to use Optimizpress to build pages and export to flat pages that don’t need the WordPress database, which would give users faster development time and website visitors a lightning fast experience. Anyway, well done on the new look. Yes, unfortunately all the gurus promote the poorer hosts cause they pay high affiliate commissions. I would choose a premium host, expect to pay $15 upwards. OP3 sounds really great. I was this close to purchasing OP2, but since OP3 is a completely different framework, I’m not sure I want to buy OP2 and spend time creating a website only to have to recreate it in OP3. Is the release one month out or more like 6 months out? I can wait one month, but not six. Hey Aaron, Beta testers will give their feedback and then we have to fix any bugs they report. It wont be 6 months. Conversion and sales tracking improve. I would love to be able to see how much money I’ve made for website in Specific period like in clickfunnels. Hi Marko, that’s more of a shopping cart feature. We might look at that one day but we can’t be everything. There are some brilliant shopping carts out there so we should leave those companies to do what they do and we’ll stick the marketing pages and sites for now. Wow!!! Very Nice!!! I have Op 2.0 i need buy op 3.0 or its for free to me? Op1 was amazing. Made me good money. Op2 was a differant story… lots of glitches and took an age to make a webpage. Curious for op3. Maybe you guys can make standard funnels like russel brunson software? Glad to hear Pil. If we make funnels we will be sure to make it simpler. What about the SmartTheme is there any planning for update with more future and some improvements. The market is a mess right now so this was much needed. I love Optrimize Press however i’m a bit skeptical with OP3. 1) There’s no release date and we’re only being shown a small snippet of what it can do and no mention of what problems it has since fixed since OP2. 2) What were being shown is a editor and features many other drag and drop editors have had for years now (Visual Composer, Divi, etc). I’m starting to think that even with OP3 customers are still going to be behind the fold on what other companies are providing, hence why we’re being kept in the dark..
Hey Paul, thanks for your comments and we understand your scepticism. One thing we’ve done with our new editor is consistently compare it to other editors and we want to create a fast loading page builder but also simplfy much of the way we create pages. Yes other editors have these features and with that in mind we’ve bundled some other features they don’t have. 1. It’s impossible to give a release date until our beta testers report back. Once that’s complete we’ll post an update. 2. We certainly aren’t keeping you in the dark. Agreed, the other editors have had these features for sometime which is why we’ve worked on improving what is already out there. Hi, I honestly think the members area is very complicated. I’m looking forward for you guys to make the members area simpler be simpler to set up. I think you’re already taking too long to launch the new version since the announcement. Already have an expected release date? Thanks for the feedback Mauricelio. Please do email any suggest on how we can improve the members are to our support team. Regarding the launch please sit tight. We’re getting the beta tester using the new editor first. They will report any bugs and then we can fix those before rolling it out to customers. Beta tester are starting the end of this week. Thanks for your patience! YES YES YES! Drag and drop pre-built sections is a GAME CHANGER and the one feature I’ve been waiting to see OP release, and now it’s a reality! I am so excited for OP3! Front-end style editing + sections makes OP3 a no-brainer home-run now. Gone are the days of waiting for popup editing windows, just click and edit. I’ve had to rely on WPBakery Page Builder for this front-end editing, but now OP does it all. Great job team! I am finalizing our 2019 strategic plan. Any news on OP 3.0t schedule? WoW you build a small version of Elementor. Haha! Good one. We’ve been tested every page builder to ensure we have a fast and smooth tool. You’ll love it! Hi Team. I’m very keen on implementing this in our business this year. Can you please advise of the release date to exisiting customers (Active licenses)? Any update on timelines for OP3? The BETA people will be playing with it first then we’ll update everyone! How do I get into the beta group? Thanks for your suggestions Manolo. We do already have Woo layout for the SmartTheme. Not sure what else we could do with landing pages. Will we have the ability to determine and save the default for a drag and drop item on the interface? I don’t want to be forced to choose font, size, color, etc, everytime I want to use a component? With that will we have the ability to create our own page templates and save them. What is the releasing date? This sounds like a great evolution of the OP product! When do pre-sales start? Is this version available yet?